True superdistortional model. Three ceramic magnets give enorm output to this pick-ups. Excellent sustain. P-up is built maximum feed-back resistance. Very similar to the OTT but more treble tones. Slightly less power as OTT. Very dynamical. For bridge position. kicking sound. For bridge position. and with white covers, too! Similar to PLUS B less magnetic field. Plastic covers are potted with epoxy and instead of lead wires solder tags used for ulimate long life. Pick-ups are built for maximum feedback resistance. Excellent dynamic and sustain are typical of these pick-ups. Vintage style suitable for finger picking. Smooth frequency respone slightly higher output such SSD. Both bass HB have 62mm magnetic system. Solder tags used. Fully screened and cover potted with epoxy. 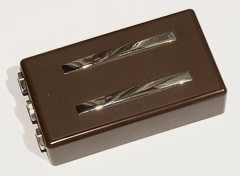 Available with Alnico 2, 3, 5 and Neodym magnets. 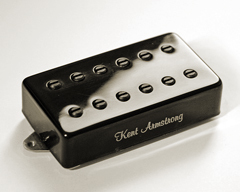 Also avaible as humbucker. Very similar to the STANDARD. hard-kicking sound but no distortion. Simmilar to SCV but little less trebles. Mid frequency orientated p-up recommended to bridge position. All above single coils are avaible with AlNiCo II, AlNiCo III and AlNiCo V bar magnets (on special request also with ceramic bar magnets). tags used. Only in black. 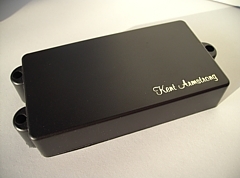 Ultra thin alnico humbucker for Dobro or acoustic guitar. Bar alnico magnets are 58 mm long. Sizes for cover are 30 x 85mm, thickness is 6,4mm only. in standard Jazz Bass cover. 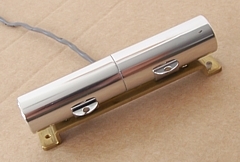 Magnetic system is 80mm long. 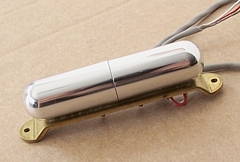 Magnetic system is 92mm long. All JB p-ups available in sound: Jazz/Funk, Classic, Rocker and custom work on special order. Plastic cover potted with epoxy, fully screened and feedback resistant. This preamp is custom designed exclusively for bass to improve its tonal quality and decrease output impedance what eliminates treble loss. Significally improves sound of the instrument, increases punch and sustain. with specially taylored bass frequency. Dimensions: lenght 42.5mm, width 11mm, height 25mm. (works well also with 4-string bass). 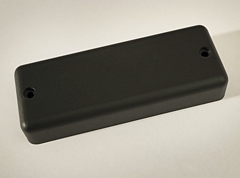 Bass humbucker with 66mm ceramic magnet system. 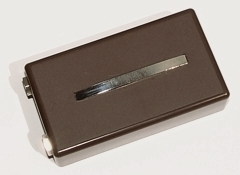 Avaible also with AlNiCo bar magnets. bumbucking". 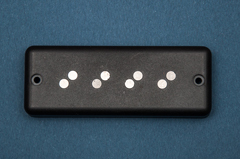 Pickups are built for maximum feedback resistance. 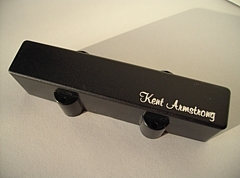 Custom bass humbucker with magnetic system up to 125mm. PB cover; tagged for series/parallel selection. Suitable also for 5-string bass. 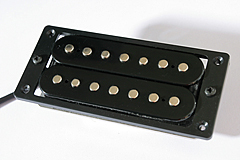 Soapbars are tagged for single coil version and series/parallel humbucker. Avaible with neodym or with ceramic magnets. 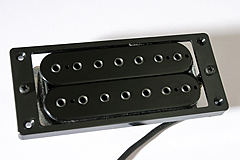 Our BRAND NEW BASS pickups. with medium output level and very good attack. NEW!!! 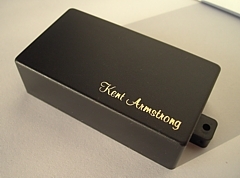 - Custom Pickups for 7-string Guitars - NEW!!! 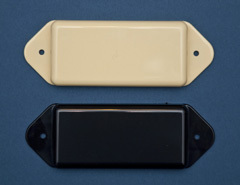 Available with ceramic or alnico magnets. Fitted with 4+1 cabel. 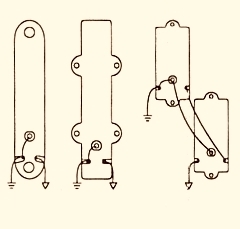 The back of a pot, switch frame, etc. to the earth side of the jack. CAUTION: Do not overheat solder tags. A set of three for Strats. 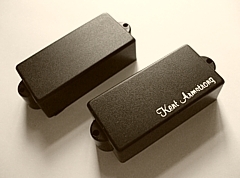 Low output AlNiCo single coils for a true vintage sound. A set for JB type basses. on Lakland Jerry Scheff Signature series. Sadowsky, Mark Lacey, Procházka, DeCara, Manzer, Keller, Andersen, Moll, Comins, Sonntag, Saggitarius, Campellone etc. 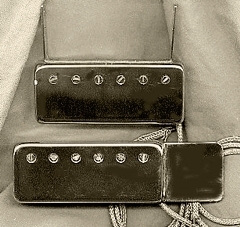 The state of the art magnetic jazz pickup. 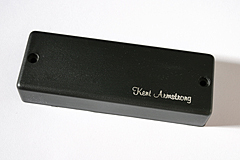 The Armstrong Handmade Adjustable PAF is peerlessly quiet, fat and smooth, all handmade with an elegant matte black epoxy body. 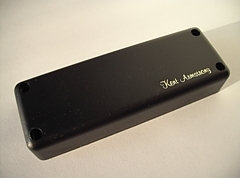 It is the pickup of choice for many major builders including Andersen, Campellone, Comins, Manzer and many others. Available in either 6 or 7 string configuration. in the USA by Kent. 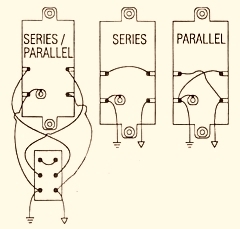 In addition, Kent has tapped the coil with three connector lugs, so the player may choose either of two output impedances: 7K or 10K ohms, or even switch between them while playing. 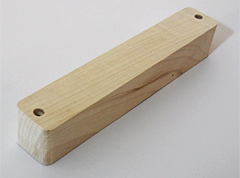 Pickup body is slightly arched to match the arc of a radiused fingerboard. 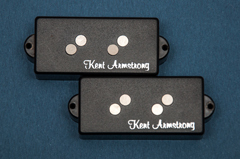 Each pickup individually handmade in the USA by Kent. The NEW among the Classics! 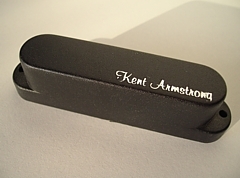 Kent's own premium quality handwound pickup coils and magnets. 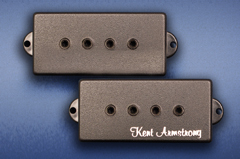 Interchangeable single-coil p-ups. Wide variety of sound. Stránky sú optimalizované pre rozlíšenie 1280x1024 bodov a prehliadač Microsoft Internet Explorer verzia 5.0 alebo vyššia. These pages are optimalized for default 1280x1024 pixels and for browser Microsoft Internet Explorer vs. 5.0 or later.